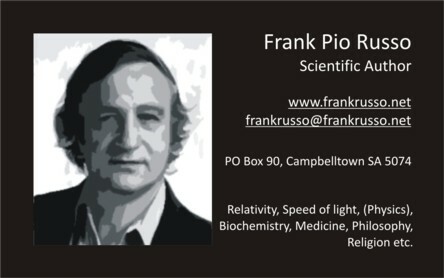 Frank Russo has an IQ of 160 and has 576 articles on his website authored mostly by himself — a man uniquely intelligent. In Investigator 160 Mr Russo expounded a "Rainmaking Proposal" which he previously sent to Australia's Science Minister. Russo says in article #468 on his website: "It certainly appears as if my rain-making project is now being used on a large scale. There have been unprecedented rains all over this Australian continent..."
Russo has studied Relativity for over 25 years. Dozens of his articles deal with Albert Einstein, speed of light, gravity and other topics in astronomy. In article #130 Russo says: "Einstein is held up as a rare genius... The truth, however, is very different. Einstein was an inept and moronic person..."
Popular on Russo's website is #54 "Door to Door Muscleman Gets Second Thoughts" which originally appeared in Investigator Magazine and gives biographical material. Amazing is article #543, titled "What the medical world should be working on", where Russo reveals some unusual experiences. Mr Russo's son, Joel, occasionally helps out. Article #497 by Joel proposes a cure for "drug induced dry eyes". He suggests rubbing onion juice "around the orbits of the eyes" and "the relief that the flow of natural tears brings is incredible!" Investigator has not confirmed this; therefore check with your doctor. My physics has shown that there are an infinite amount of smaller and smaller particles in the universe, and these are in turn constantly aggregating themselves to build bigger and bigger entities... It therefore stands to reason, that we as living beings are simply aggregations of smaller and smaller living conscious entities! In my many writings I've often referred to the next level 'down' as being the world where our atoms would be the equivalent of universes, and where gravity would be 10 to the 40 times stronger because of the much smaller physiological meter, hence their world would - to us - appear much faster! This concept is not that strange at all... and it's very similar to what the Star Wars movies expound, namely that we're all made-up of 'little creatures'... I've often called these "10 to the minus 40 gnomes". To read the indisputable evidence go to Mr Russo's website. And while you are there, read also the other 575 articles. Regarding the IQ of 160 attributed to me in Investigator 172 page 44. In my youth I scored 170 but age and illness have probably reduced this by now substantially.